This is a square Trinity Cement porcelain sign. This particular Trinity Cement sign is predominantly blue and yellow with red and blue text. 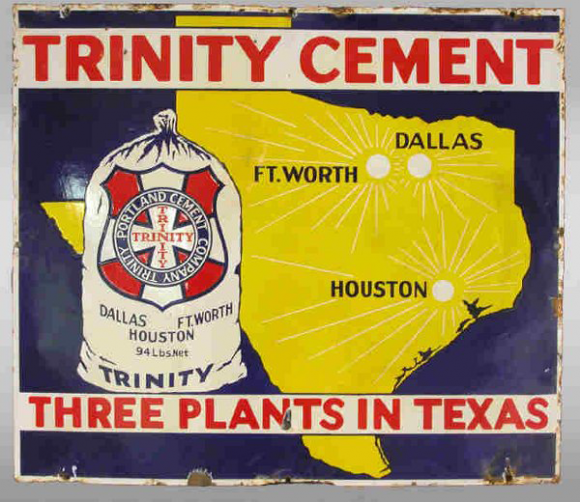 It reads, “Trinity Cement, Three Plants in Texas, Dallas, Ft. Worth, Houston, Trinity Portland Cement Company, 94 lbs. Net, Trinity” and features a white sack of Portland Cement next to a yellow Texas in the center of the sign.